New foliicolous fungi from the campus flora of Madras Christian College, India. Hosagoudar, V. B., Robin, P. J. 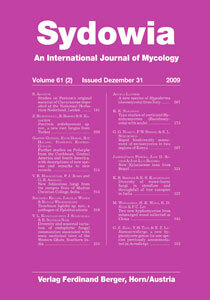 & Archana, G. R.(2009) – New foliicolous fungi from the campus flora of Madras Christian College, India. A casual visit to the Madras Christian College, authors collected five foliicolous fungi. Of these, Asteridiella emciciana on Scutia myrtina (Burm. f.) Kurz (Rhamnaceae) and Asterina emciciana on Maerua apetala (Spreng) M. Jacobs (Capparaceae) were found new and are described and illustrated in detail. Key words: black mildews, tar spot, Asteridiella, Asterina, new species.